Right then let’s move from what I think the whole world should be drinking and on to what it seems the whole world is drinking, GIN! For the purposes of humour ‘gin kit’ is supposed to sound like ‘gym kit’ although I would normally call it PE kit and then the whole thing falls apart so just go with it. 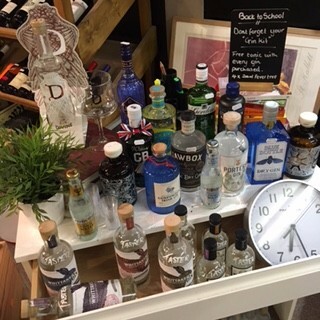 Buy any bottle of gin from our really very impressive selection and get four bottles of Fever Tree tonic free so you have the perfect way to unwind after spending the last two hours trying to remember what an adverb is and what the actual values of x and y are whilst all the time trying to sound like it really will come in handy for them in later life. If x is one part gin and y is one part tonic then could I please order an xy2, oh and with ice please.